Harold James Frederick Gleed, later known as Bam, was the second son of Ernest William Gleed, a baker, and Mary née Brown. Harold was born in Frampton on 2 August 1899 and baptised on 15 October the same year at St Mary's where his father was parish clerk and sexton, roles previously held by Ernest's father-in-law, Giles Frape. When the census was taken in 1911, Harold was still at school along with three of his sisters; his older brother, William Joseph Ernest, was already at work, and his older sister, Jane, was assisting at home. 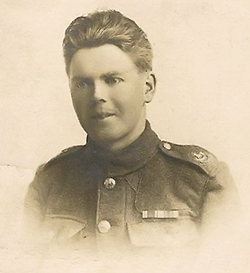 Details of Harold's enlistment into the Army have not been found although anecdotal evidence suggests that another of Frampton's servicemen, Timothy John Sims, met Harold on his birthday at Ypres. We only know of Harold's record from the medal rolls which confirm that he served as a private in the Duke of Cornwall's Light Infantry (but unfortunately not which battalion), and later in the Army Ordnance Corps. He was transferred to the Reserve on 20 November 1919 and awarded the British War Medal and Victory Medal. His service is commemorated on the plaque in the village hall and his family still retain the certificate which the grateful people of Frampton awarded him. After the war, Harold returned to the village and worked at Cadbury's. On 15 September 1924 he married Ruby Emeline Morgan at St Mary's and moved to Saul. Two sons followed, Eric James and Kenneth Morgan. Harold James Frederick Gleed died on 10 August 1963 at Roselea, Saul, and was buried at his parish church of St James the Great.